Your personal style is impeccable, and you want to share it with the world. Have you considered starting a fashion blog? Fashion blogging lets you share the best things you know about style with others. Whether you want to showcase outfit ideas, explain the principles of how to dress well, or just drool over the latest looks you saw at Fashion Week, a fashion blog is the place to do it. Sharing your passion for fashion, however, can be a challenge if you’ve never created a blog before. The number of things you have to do can seem overwhelming. Where are you even supposed to start? While it’s normal to feel overwhelmed, starting a fashion blog doesn’t have to be stressful. There are just a few key steps you need to follow to take your blog from idea to live website. In this step-by-step guide, we’ll help you through the process, showing you the seven easy steps you need to create your fashion blog. One of the greatest challenges of starting a new blog on any topic is finding your focus. You want to blog about fashion, but “fashion” is a broad topic. What kind of fashion? Haute couture, or boho-chic? Men’s, women’s, or a style that transcends gender? And that’s just the start. You also need to consider if you’re going to write tutorials, discuss trends, review products, or do something we haven’t even thought of. Whatever you choose, you need to make a deliberate choice from the start. If you don’t, then the time (and money) you spend setting up hosting, buying a domain, and writing content will all be a waste. Without a clear focus for your blog, it’s easy to abandon the project the first time you encounter difficulty. If you know what you want to say, however, then it’s much easier to persevere. But what if you don’t know what you want to talk about on your fashion blog? What if all you have is fashion sense or a passion for the fashion industry? To help you get started, we want to share some examples of successful fashion blogs that you can use for inspiration. These successful fashion bloggers cover a variety of different topics in an even greater variety of ways, but all have found an audience. We hope that examining them will help you find your own unique voice. Chronicles of Her is the project of Carmen Hamilton. What began as a personal blog showcasing Carmen’s outfits has evolved into a comprehensive online destination for women’s fashion, with outfit ideas, fashion and beauty tips, and clothing reviews. This blog is an example of the value of starting with a clear, focused topic in the beginning (in this case, outfit ideas). It might feel limiting to start with a single topic, but this blog shows that you can build upon the success of your initial idea to create something that’s larger than you. However, you can’t start there; you need to build a foundation first. Effortless Gent is a reminder that men can start fashion blogs too. We know we shouldn’t have to say this, but it’s easy to associate “fashion blogging” only with women’s fashion. Remember: men want to dress well, too (even if they’re not always as willing to admit it). The bigger lesson here is that you can find your blogging voice and personal brand through speaking to an audience that other blogs are neglecting. Sure, we’re not saying that there’s a shortage of men’s fashion blogs, but Effortless Gent nonetheless derives a large part of its appeal from focusing on men’s fashion (and, more specifically, a lean and minimalist look). Speaking of which, be sure to take some design cues from this site; its gorgeous minimalism perfectly matches the aesthetic of the outfits and style advice you’ll read about in its articles. 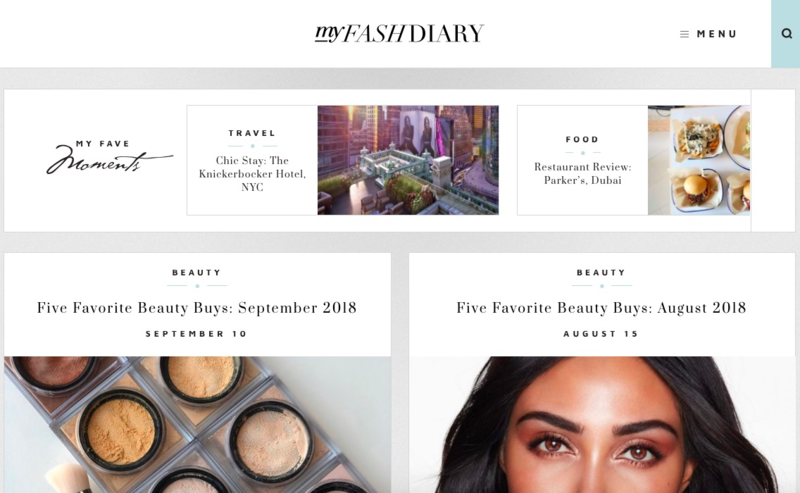 MyFashDiary is a celebration of Tala Samman’s favorite things in fashion, beauty, travel, and food. That’s right: it’s a broad collection of topics, and that’s not something we recommend you emulate as a new blogger. We can’t think of a better philosophy to follow when creating your fashion blog. Your readers want you to guide them; don’t shy away from sharing your opinions, likes, and dislikes. No one wants to read an ambivalent fashion blog. Aimee Song is a fashion and interior design blogger. On Song of Style, she shares looks she creates for major brands and everyday life. She also provides extensive coverage of the various fashion weeks (and other major fashion shows) across the world. Her blog is a great example of how you to cover fashion industry news in an interesting way. Instead of just telling you about the newest pieces from a designer, she shows you how you can recreate the looks on the runway at an affordable price. You can learn more about this technique in our guide to affiliate marketing. This is also a valuable lesson in how you can monetize your blog in an unobtrusive way: For each piece she links to, she includes an affiliate link to Amazon or another relevant site so she can receive a commission to help pay for her blog operating costs. Finding a domain is easy in principle, but the details can be frustrating at times. The first thing you should understand is that all the good domain names are already taken. Okay, so that’s an exaggeration, but you should expect to come up with a variety of domain names before you find one that’s both available and affordable. Besides that, you need to choose a domain name that encapsulates your blog’s topic while also being able to grow with your site. In other words, you don’t want to choose a domain name that’s too specific. Otherwise, you risk pigeonholing yourself into one topic. We advise against including your name in your domain, as it can make it hard to expand if you ever decide to bring on other writers (or even sell your blog if it becomes successful enough). In general, you want to keep your domain name short, memorable, and easy to spell. If it can also be clever or funny, then that’s a bonus. If the domain is available, you’ll be able to purchase it. You’ll also have the option to add hosting for your domain, which we’ll cover in the next step. A domain name is no good if you don’t also have a place for it to point to online. If your domain name is like an address and your blog is like a house, then your web hosting is the land where your house exists. Without it, your blog is just a collection of materials. There are lots of web hosting companies out there, but we recommend Bluehost. It’s affordable, reliable, and allows easy installation of WordPress, our blogging platform of choice. You’ll also get a free domain when you sign up for any hosting plan, saving you most of the upfront costs that come with blog creation. Purchasing hosting is a simple process. Visit the Bluehost website to get started; they will walk you through the entire process, and they even have sales specialists who can help you if you have any specific questions. Once you’ve purchased your hosting, you’ll need to install WordPress. If you’re not familiar with WordPress, it’s a free blogging platform that allows you to write and publish blog posts without having to know any code. It also has a large database of available themes and plugins (many of them free) to help your blog look and perform its best. For these reasons, we think it’s the best blogging platform for new bloggers. That’s all there is to it. With WordPress installed, you can now get on to choosing how your site will look. Installing WordPress is enough to get you started, but we’d suggest that you customize your blog look beyond the default WordPress theme. There’s nothing wrong with it, but the default WordPress blog theme can be a bit boring. Be sure to look at the reviews of a theme before choosing it. Also, pay attention to when it was last updated. You don’t want to use an out of date theme, as it can cause both functionality and security issues. Click on “Add New” at the top of the page. Congrats! The new theme is now live on your site. Okay. You’re done with the technical steps. Now, you can focus on your blog content. You should aim to write your first five posts before you officially launch your blog. This is for a couple of reasons. To start, it will keep you from getting behind on content. You don’t want to have to come up with a new topic each week at the last minute. That’s a recipe for burnout and a sporadic posting schedule. If you have a few posts ready to go, it will be easier to stay on track. Furthermore, having five posts written before you launch will ensure that your blog doesn’t look empty. If you just have one post on your site when you launch, then people will know that your blog is new and won’t trust it as much as a blog that has several posts. A blog like that has more credibility. We know writing five posts can feel daunting, but you don’t have to write them all in one day. If it takes you five weeks to write them before launching, then that’s okay. You’ll learn some valuable lessons about how long it takes you to create content and how much bandwidth you have within your schedule. Once you have some posts written, you need to promote them. This is especially crucial when you’re starting out and building your blog audience. Social media is the classic way to promote your blog content, and it can work…to an extent. However, you should be mindful of which platforms you use. At this point, posting to Facebook isn’t going to provide a very high return on investment. The site’s algorithm ensures that only a small number of your total followers see what you post. You can get around this by paying to boost your post’s visibility, but this isn’t a good strategy for promoting your fashion blog (especially not as a beginner). Instead, we recommend posting on Pinterest and Instagram. These are far more visual platforms than Facebook, and they’re great for showing off outfits, doing quick tutorials, or repurposing your blog posts into a different form. It’s also worth looking into search engine optimization. It’s beyond the scope of this post to discuss how to do this, but it’s basically the art and science of getting your blog posts to show up in Google when someone searches for a particular topic. For instance, you might have a post on “outfit ideas,” and you want to try to have it appear first when people search “outfit ideas” in Google. This isn’t a very realistic example, as this would be a very competitive topic to rank for even for an established blog, but it gives an idea of the principle. To learn more about SEO for bloggers, check out The Beginner’s Guide to SEO from Moz. If you’ve made it this far, then you’re already well on your way to becoming a successful blogger. The key to finding long-term success in blogging, however, is to keep experimenting, learning, and persevering. You can’t let your blog content become stagnant; you’ll be left in the dust just like last year’s fashion trends. It’s imperative that you do as much as you can to learn more about both blogging and fashion. Don’t be afraid to try new things with your content. Especially in the beginning, there’s little risk to experimenting with the length of your posts, the types of images you use, and the types of posts you create. As your site grows, you’ll have a base of readers to whom you’re accountable, so enjoy the freedom of experimentation you have in the beginning. Creating a new fashion blog can feel daunting, but you should now be well-equipped to take on the task. It doesn’t have to be complicated, especially with tools like WordPress and Bluehost to make things easier. Plus, once you’ve done the upfront work to create the blog, you can focus on the writing and publishing while everything else just runs on the background. For more information on how to start your first blog, we recommend our complete guide on how to blog. It will take you from never having written a blog post to publishing your posts to a growing audience. To get weekly blogging tips straight to your inbox, subscribe to our email newsletter.